Jenji Kohan’s Netflix smash “Orange is the New Black” is back to doing what it does best: character exploration. Season three opens with a new and (relatively) improved Pennsatucky doing her best to be more respectful of others and less uptight about vulgarity. She’s genuinely trying to better herself, and it’s incredibly satisfying to see her transformation from a villain to someone reformed and compassionate. The season builds from there and the first six episodes suggest this season will be the best, most emotionally complex, season to date. Thankfully, the Piper/Alex drama resolves fairly quickly and focus pulls away from the two just enough to focus on other, more interesting characters while keeping Taylor Schilling as the top-billed actor. The show is able to remain fresh and captivating by not dwelling on this will they/won’t they pairing. Litchfield has turned upside down as conditions improve for inmates. Little victories following a bed bug infestation change the attitudes of several inmates, like Red. Because only so much happiness can go around, the prison guards are getting the shaft as a change in ownership of the prison means fewer hours and slashed benefits. The question arises as to who the real prisoners are (hint: still the actual prisoners). This shake-up is thanks in part to the addition of newcomer Mike Birbiglia’s character, who flawlessly brings a layered, subtle and mysterious performance with each line. The show also welcomes Mary Steenburgen. Like Birbiglia does to Joe Caputo, so does Steenburgen, playing former guard Mendez’s mother, complicate the pregnant Dayanara’s life. Daya, meanwhile, grows more and more isolated as she runs out of options for how to take care of her unborn baby. The show has shifted from the man vs. man-style of conflict to man vs. self. Nicky battles her addiction more than ever. Morello is depressed, having lost her job driving the van. Chang, in one of the best episodes so far, struggles with immense insecurities and loneliness. Crazy Eyes refuses to accept the loss of Vee, her mother figure. 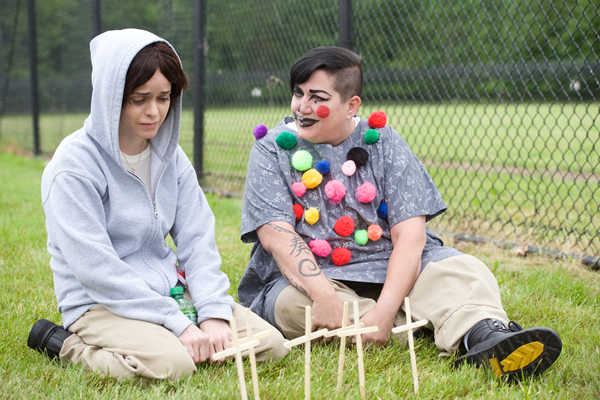 These and other internalized conflicts become more of a prison for the characters than Litchfield itself, as they fight to free themselves from their masochistic choices. Tribe members intermix less than they have before, with the exception of Soso, who struggles to find her place in the prison. Even Chang, the other prominent Asian character, does not accept her, as Soso is part Scottish. However, this racial isolation has given room for new bonds to form, like the budding friendship between Boo and Pennsatucky, which began at the end of season two. The unlikely pairing of the unapologetic lesbian and the religious zealot proves to be among the most delightful relationships of the new season. They help each other accept their past mistakes, learn from them and grow. They’ve each toned down their respective idiosyncrasies and welcome each other as friends and equals. Boo’s intellectualism and Pennsatucky’s emotional side complement each other well and they somehow find within the other a support system. One of the more heartbreaking character explorations focuses on Marisol “Flaca” Gonzalez (Jackie Cruz). We learn the reason for her teardrop tattoo and the guilt she carries. In one episode, her story comes full circle. The promise of a new job assignment quickly changes from a symbol of hope to one of futility, as she ends up right back where she started before being sent to prison. While others thrive under the new administration, she’s lost her light. It’s a powerful moment for Cruz, who has shown she can dominate a scene just as well as Laverne Cox, who is tragically underused this season. With each season, “Orange” explores themes surrounding motherhood, and season three is no exception. Can bad actions define a good mother? Can a mother’s best intentions still fail to help her daughter? How does motherhood transcend blood bonds? What happens when we have no parental figures to turn to and we’re left on our own? While conflicts in season three are much more internalized than in previous seasons, they are no less thrilling. Some of the best bits are tips of icebergs that suggest a much more complex story waiting to be unraveled in a future episode. When the enigmatic Blanca Flores attends the “book funeral” (a necessary book burning following the bed bug infestation), she explains sadly that she prefers reading over living her own life. But as always, when things seem darkest in Litchfield, there’s always hope tomorrow will be taco night.